Our Auto Splice Dual Unwinder (ASDU) with Festoon is a high-speed servo drive, PLC controlled, continuous feed unit designed to roll up to your production line and improve line efficiency with minimum operator effort. The ASDU with Festoon features speeds up to 5,000 inches (127 m) per minute and comes equipped with dual 20 inches (508 mm) unwinds. The ASDU’s label sensor and DC servo ensure tight and accurate label splicing. A variety of label sizes can be handled (for example, promotional and coupon labels) by the ASDU and is compatible with all Label-Aire labellers as well as other brands of labellers. 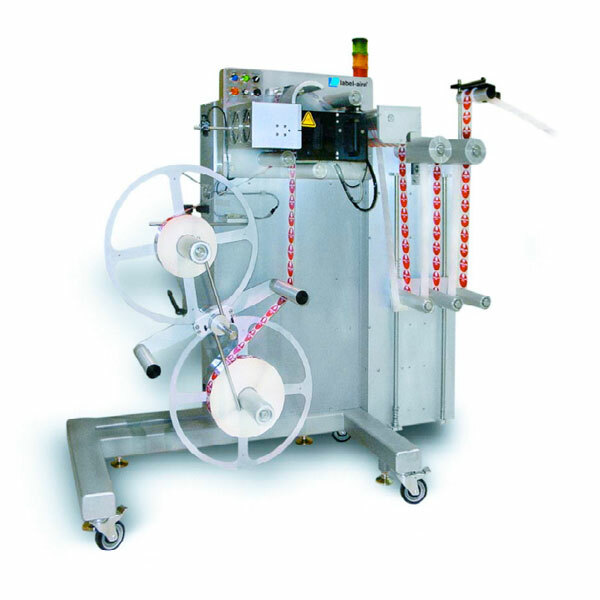 Roll the Auto splice Dual Unwinder with Festoon up to your production line and immediately increase line efficiency freeing up the operator for other production tasks. Festoon provides consistent tensioning of labels throughout system. Servo drive provides labels to applicator at labelling demand rate for smoother operation. Eliminates stoppages due to roll changes. PLC controls with DC servo for tight and reliable automatic splices. Dual 20″ (508 mm) diameter unwinds and automatic splicing eliminate downtime.